Last week, I spent a whole lot of time revisiting some of my favorite haunts, ones I've not been to in eons. One of the best is Shan Grocery. I hadn't been there in months and months and since my last visit, they've gone and created a whole new restaurant. Used to be, it was just a tiny cafeteria in the back of a dusty convenience store, but now they have a connecting doorway that leads to a brand spanking new dining room. Though it was just me eating, I couldn't help but order two entrees and three appetizers. 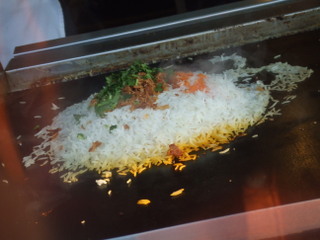 The prices are so cheap (I got out of there for $16 bones) and the food is just so tasty, I have to sample everything. 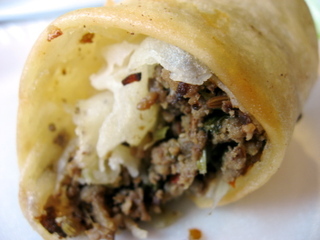 These chubby little meat-stuffed eggrolls are my favorite of all time ($1 each). Crispy, flavorful and filling, they're the perfect snack. You can buy them up front in a glass case by the sweet counter, too, just in case you don't have time for a full sit down. I've been commuting to the suburbs for three very long months and the baseball reality TV show I'm working on ends in just over a week (they lost the playoffs). I've been giddy over the thought that I'll soon be able to roam my old grazing haunts, and until today, I seriously doubted that I'd ever return to the dreary suburbs. 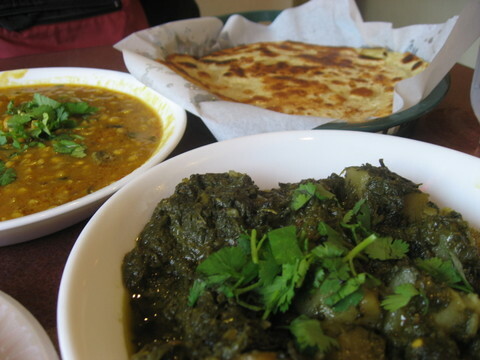 That is, until I made my way through the buttery naan-filled lunch buffet at Spice In Cafe, a just-under-a-year-old Indian restaurant in one of the dozens of strip malls populating Hoffman Estates. What is it about strip malls and good food? You'd think cheap rent would mean mediocre food, but that seems to never be the case. It's more like cheap rent means damn fine home cooking, especially outside the city. The very simplest of food is what always catches my eye. 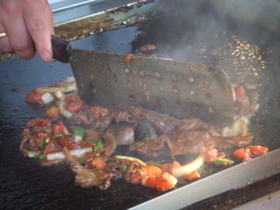 I swear, all that crazy jazz top chefs are whipping up all over the place (meals made of foam and full-on tastebud trickery) is for the birds...gimme a pile of rice, meat and fresh herbs sizzling on the griddle anyday. This meal is from one of the awesome restaurants over on Devon Ave., and every time I walk up and down that street, I'm slammed with sensory overload. The smells, the smiles, the sighs of utter joy every time I see a chef carving meat, flipping rice or fiddling with tandoor bread---I love it all. Today, I want to go exploring in Pilsen, but its pouring rain and I'm working...but when huevos rancheros calls, there is simply nothing that can be done but to answer the call. What is it about plain old eggs, beans (they gotta be whole) and rice? Again, it's the simple stuff~~I mean, seriously...who the hell can deal with eating foam? Christ. Roscoe Village is a great place to skip around, but sometimes I need a full-on switch. When that mood hits, the madness of Devon Avenue is the perfect place for me. I love the scents of charred, cracklin' meat; the rumbles of Indian tunes; and the loud colors of saris on parade. Getting there isn't a problem, but deciding which restaurant to hit up sure is. They all look good and smell even better. There are traditional all-you-can-eat buffets for less than $10 to consider, but then there's also the delicious chaat houses doling out Indian-style tapas on every corner. The eatery that always catches my eye, however, is the Indian/Pakistani Ravi Kabab House, 2447 W. Devon Ave., with its giant glazed and smudged over front window. I love it because you can peer into the open kitchen and see what's being whipped up every time a new order is place. Every now and again, I get an email fired off to me by a serious food lover who claims to have a line on a spot I have yet to discover. Sometimes they're right on and I discover a mind-blowing gem, and sometimes they're way off, and I'm led to a place I've already hit and dismissed...old news, baby. This time, though, I had a winner: An email came down the transom last week from a passionate fella, a devout foodie and world traveler named Rich Cohen. He preached about having deep insider knowledge to the Chicago underground food scene and wanted to show me a few hidden places that serve delicious food (and that wouldn't even pop up in a google search). He hit me at a rare moment of weakness, one where I was convinced there was nowhere else to discover, so I said, "Where and what time?" Next thing I know, I was knee-deep in a roomful of wild-eyed Pakistani men (oh, was I supposed to sit in the female-only dining room? ), all gazing curiously (ahem, balls-out staring) at my eating buddy, Chezne, and me, as we waited on a stranger who I only knew via the Internet to come and show me his goods. 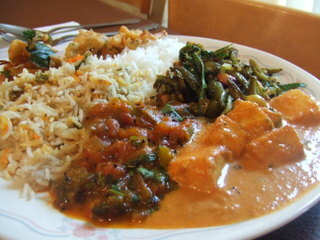 Not once in all my years in Chicago have I heard the words "Bhabi's Kitchen" uttered. Have you? Well, nobody that I've met had ever heard of this just-off-Devon hideaway either, but I have a sneaking suspicion that all of that is about to change, especially since they just expanded from a scant four tables to a bustling side room seating more than triple the original capacity. I happened upon this feverishly authentic Indian restaurant via one of my favorite ways of finding new places to eat: the Internet. Doing some random google search (what did we ever do without this tool? ), I ingested review after raving review, stating that was the best Indian in Chicago; like eating in a real-deal Indian kitchen. Needless to say, that was an understatement. Just when I think I know all there is to know about my favorite thing in the world, sweets, up springs another glorious treat that totally knocks my socks off. A few weeks ago, I happened to be drifting up and down the Indian section of Devon Avenue (yes, contrary to popular belief, there are different sections of this melting pot of a street; Jewish, Indian, Pakistani, etc…), and blindly came across one of the most fascinating and addictive faux-milkshakes I've ever encountered. I couldn't seem to stop thinking about it (even after a two-week stint out of town), so I headed back up for one more try. Yep, it's totally rave worthy. The setting for this encounter was an inconspicuous corner joint called Amrit Ganga, a tiki-style chaat (the Indian version of tapas with a fast food spin) house that is usually packed with lots of local Indian flavor, all getting their spice fix. In the deadly heat that's rockin' the city right now, I can't even stand the thought of eating something warm, much less adding more fiery spice to my meal. That's where the acclaimed drink called "falooda" comes into play.